COLUMBIA, Mo. – Missouri’s recently-elected U.S. Senator has decided to bring two familiar faces into key positions within his new office. Josh Hawley has selected Kyle Plotkin, his U.S. Senate campaign manager, to serve as his chief of staff and Daniel Hartman, currently chief of staff in the Attorney General’s Office, to serve as state director. 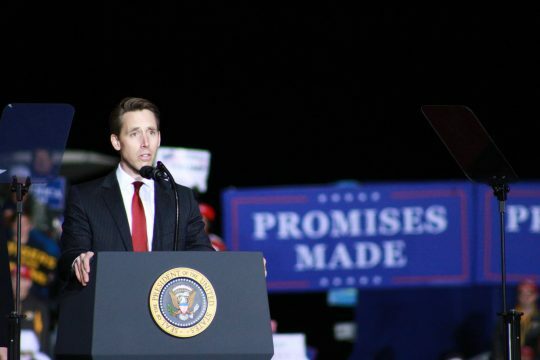 Hawley won a hard-fought U.S. Senate race on November 6, 2018, against incumbent-U.S. Sen. Claire McCaskill. He will be sworn into his position in January 2019. Plotkin was the campaign manager for Hawley in his successful bid to ousts the sitting Democrat. Plotkin has previously served as chief of staff and chief spokesperson for the Governor of Louisiana and in a variety of roles in state government and political campaigns. He has also worked in the private sector at firms including McKinsey & Company and Purple Strategies. Hartman, who successfully managed Hawley’s first statewide campaign in 2016, serves as chief of staff to the Missouri Attorney General. A native Missourian, Hartman served as an infantry officer in the U.S. Army’s First Infantry Division. After leaving the Army, he earned a law degree at the University of Missouri and later managed the successful 2016 campaign of Missouri Attorney General Josh Hawley.